The solar investment tax credit is a 30% tax credit offered to homeowners that choose to switch to home solar power. The solar investment credit applies to the cost of your entire solar system including both equipment and labor. It is one of the most important federal programs helping consumers make the switch to clean affordable solar energy on their homes. The tax credit has encouraged utility companies and others involved in the solar industry to make long term investments that have driven prices down and stimulated research, development, production, competition and further growth in the market place. The solar investment tax credit has been a driving force in making home solar power affordable. The first thing to understand is the difference between a tax credit and a tax deduction. Most people are familiar tax deductions wherein you are allowed to deduct varying amounts from your taxable income. With a tax credit you are allowed to subtract a set amount of money directly from what you owe in taxes. If you purchase a home solar system you will be able to subtract 30% of the cost of your system directly from the taxes you owe. 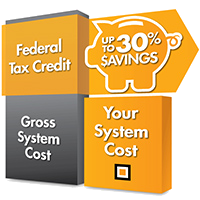 If the 30% of the system cost is more than you owe in taxes you are able to roll over the amount you don’t use and apply it to the next year taxes. In addition there are no caps on the amount of the tax credit. You get 30% – dollar for dollar. If you have chosen to take advantage of a solar lease or PPA the 30% tax credit will be used by your solar service provider to offset the cost of equipment and installation. 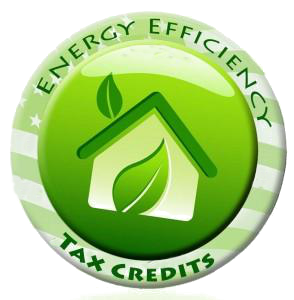 The tax credit is used in this way to allow for free installation of a solar system on your house and you start saving on your energy bills immediately with absolutely no out of pocket costs. Our Solar Experts are able to fully explain not only the Solar Investment Tax Credit but also all other rebates and incentives that are available in your area. Whether you are interested in an outright purchase of a solar system or a Solar Lease or PPA we can guide you quickly and affordably through the process.